The NordPlant consortium consists of five Nordic universities: Swedish University of Agricultural Sciences (SLU Alnarp), University of Helsinki, University of Copenhagen, University of Tromsø – The Arctic University of Norway and Lund University. 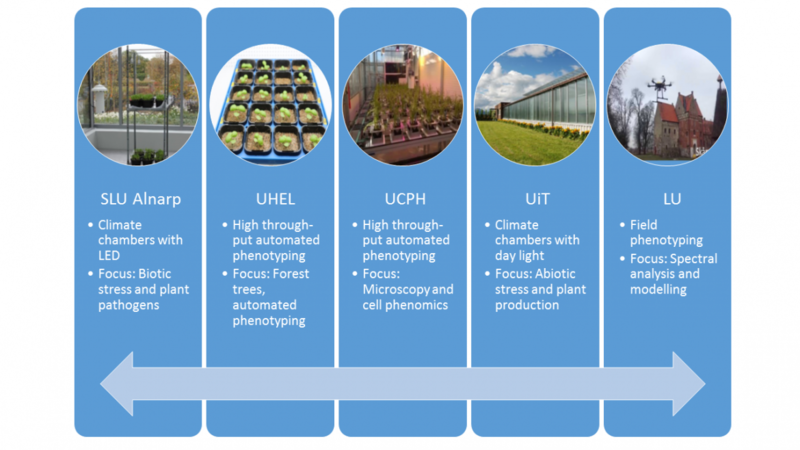 The consortium brings together the complementing expertise and already established phenomics research infrastructure at the universities, forming the foundation of an internationally competitive hub. NordPlant will provide much needed incentives for researchers to use facilities outside their own university and across the Nordic countries. Such incentives will broaden the use of the facilities at the participating partners as well as both advancing and optimizing researchers’ individual experiments. By using the complimentary nature of the available facilities part of NordPlant, new research questions will be answered. The participating facilities already today act as lighthouses for Nordic plant research, but this will be strengthened by the project and will also attract non-academic users of the facilities in for example plant breeding, food production, new plant-based materials and plant sensing techniques!